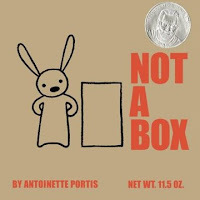 Not a Box is dedicated "To children everywhere sitting in cardboard boxes." At one time or another - and upon first glance this may seem hard to believe - it's been you. The kid sitting in the box. And me. And the kid down the street. And, well, pretty much everyone. Kid gets gift. Kid opens gift. Kid pulls gift out of box. Kid sets gift aside. Kid plays in box. And one of the biggest frustrations of being a kid is having to explain why. "Ah, sheesh," the kid mumbles quietly. "It's not a box. I...am...NOT...playing...in...a...box!" The child thinks, why can't others see what is so plainly obvious? So finally we arrive at Not a Box. (Was I right? It has been you, hasn't it?) The book opens with a simple question: "Why are you sitting in a box?" In my mind it's a grown-up asking the question. A very stiff grown-up. A very stiff grown-up who has forgotten the experience and wonder of being a child. But the straight-faced bunny simply replies, "It's not a box." Never does the bunny explain what it is, but the pictures show exactly what the bunny sees. And it definitely is not a box. 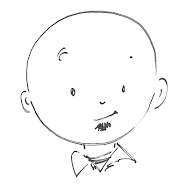 Like There is a Bird on Your Head and all the Elephant and Piggie books by Mo Willems, Not a Box works great with beginning readers to partner read back and forth. I can imagine kids making their own versions of the book. After all, what kid can't imagine something cool to do with a box? They could copy the words and style but create their own not-a-box pictures. Hey! Maybe they could even draw their pictures on the side of their very own box!